PORTLAND, Maine - July 20, 2016 - PRLog -- Richard Boyd Art Gallery's September exhibit, From A Woman's Perspective celebrates 5 women artists: Pat Chandler, Julianne Garvey, Jane Herbert, Felicity Sidwell and Kim Skillin Traina. Each artist has her own style, technique, and approach to art that has been shaped by her experiences and inner journey coming of age during the 1960s and 1970s. From A Woman's Perspective opens September 1 at 10:00 a.m. The exhibit is on view free of charge to the public between the hours of 10:00 a.m. and 5:00 p.m. daily through September 29, 2016. Pat Chandler received her BFA in Illustration from Rhode Island School of design in Providence, RI and MFA in painting and printmaking from Rochester Institute of Technology, Rochester, NY. Pat grew up in rural Maine in the 1950s where the environment was essential to her development as a child. 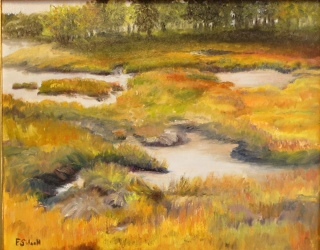 Pat says, "Maine's more remote regions inspired many of my paintings to the same degree that its landscapes informed my early life. My creative process and production inevitably refer to my geopgraphic roots. Throughout my 50 year career as a commercial and fine artist, I have retained an interest in various forms of realism persisting in contemporary 20th and 21st century art. In all of my paintings there is a continuum that began in realism but over time evolved into more expressionistic, abstracted works." Julianne Garvey moved to Maine in 1980. She studied art at The University of Georgia, her first two years of college, later graduating from The College of William and Mary in Virginia. Julie says, "Since graduating, family life and work have taken the majority of my time, but have never dampened my enthusiasm for expressing myself through many different mediums, with my first love being watercolors. I'm not sure if any artist knows why we create art, beyond the simple fact that we do. Of course living in Maine, being surrounded by the constant beauty that abounds here, is my never-ending inspiration. I do know that I love creating art and just wouldn't feel complete if I were not to do so." Jane Herbert has an unstructured approach to art and life that serves her well. As a child of the 1950s, Jane said, "I watched the building of interstate highways and followed their lines around many a bend. After a year at Montserrat School of Visual Art, I gathered my paint brushes and toured Europe in a micro-bus, painting and learning as I went. My painting style is born out of my experiences. The bold colors of the sixties have mellowed and blended with the background, along with the sometimes humorous, sometimes dark pen and inks left along the road. Life has been a creative, do-it-yourself adventure for me. I know that much of my contentment comes from the inner journey I have been on. Through my life I have embraced my creativity, and painting specifically." Felicity Sidwell grew up in England and came to America with her husband in 1971. Felicity says, "I paint outside as much as much as possible to capture and express in paint the fleeting colors of land and sky. I want my paintings to capture the feeling I have when I'm standing, immersed in the natural world around me, untouched by human intervention. In my paintings I hope to express the sense of calm I find in the fishing villages and on small family farms in Maine. That feeling of calm, seems to be part of an older more natural order that fits into the environment with a beauty of its own." Kim Skillin Traina is a graduate of Southeastern Massachusetts University with majors in visual design and photography. Her career as a graphic designer and photographer spans more than 3 decades. Kim says, "My creative process evolved from doing things by hand and developing images in the darkroom, to creating on the computer. As much as technology has opened a whole new world of creative tools for exploration, I still love working with my hands. Six years ago, my love of the Maine coast and drawing inspired me to create works en plein air, I selected pastels as my medium. Creating works in pastel allows me to capture the magic of the moment. My creativity is my expression of my passion for life, for nature, and of deep gratitude for this incredible place I live in." During the months of April through October the gallery is open between 10 a.m. and 5 p.m. daily. From November through the end of March the gallery is open between 10 a.m. and 3 p.m. every Friday, Saturday, and Sunday. Additional days and times can be scheduled by appointment. For more information about the exhibit please contact the gallery by phone at 207-712-1097, via email at info@richardboydartgallery.com or visit http://www.richardboydartgallery.com . Like us on Facebook at http://www.facebook.com/RichardBoydArtGallery .